Justice Muslim Sule Hassan of the Federal High Court in Lagos has struck out a suit filed by Lagos based lawyer Activist Ebun Olu Adegboruwa challenging the appointment of Col Hameed Ali (rtd.) 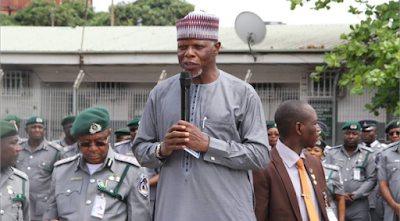 as Comptroller General of the Nigeria Custom Service. Adegboruwa in the suit filed in November 2015, prayed the court to determine if President Buhari can appoint anyone as comptroller general of customs without complying with section 3 of the Official Gazette of the Federal Republic of Nigeria made on 25th March 2002, wherein it was stipulated that only those within the rank of Deputy Comptroller General of Customs can be elevated as substantive Comptroller General. Striking Adegboruwa's case out, Justice Muslim Sule Hassan ruled that Adegboruwa lacked the locus standi to file the case because he is not a member of the custom service. He also held that the president by the virtue of section 5 of the 1999 constitution has the executive power to make appointment.